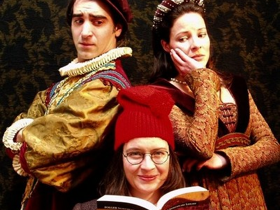 "A Great Night for Marion Day"
Touchmark Theatre has opened its seventh season with a delightful production of Ann-Marie MacDonald’s "Goodnight Desdemona (Good Morning Juliet)". Since its appearance in 1988 the play has received over 200 productions internationally and is one of a handful of plays that can be considered a classic of Canadian drama. The favoured style of Touchmark’s repertoire is poetic realism, whether it is realist works written the poetic prose of Tennessee Williams or John Millington Synge or in actual verse like those of Christopher Fry. “Goodnight Desdemona” marks a departure from this; for, while it is written in blank verse, the play is primarily a fantasy, a dramatic projection of a struggle within the central figure’s mind, her Jungian discovery of self through encounters with two of Shakespeare’s most famous female characters. One actor plays this central figure, the downtrodden academic Constance Ledbelly, an Assistant Professor at Queen’s University, whose birthday leads to a journey of spiritual rebirth. The other fifteen characters are played by only four actors. Director Douglas Beattie has assembled a fine cast with Marion Day in a revelatory performance as Constance. While the other actors-- Michael Peng, Elana Post, Stephen Russell and Jane Spence--are not all equally successful in their multiple roles, the production captures the joyous invention of MacDonald’s work and makes it seem as fresh as it was seventeen years ago. When I saw the CanStage production of the play in 2001, with the author herself as Constance, I wrote that “MacDonald gives us the definitive portrayal of this central role”. Marion Day’s portrayal is so absolutely right it rivals MacDonald’s and in many ways is superior. Constance is female nerd with hidden pluck despite a morbid imagination and tendency to let other take advantage of her. Fiction and footnotes are more real to her than anything in the outside world. MacDonald caught all this but in some ways was too self-possessed in the role while Day shows us struggle in Constance between the narrow horizons she is comfortable with and the new freedoms she discovers. Day shows that beneath the awkward movements, bad hair and constant readjusting of glasses, is an endearing person that Constance doesn’t even know is there. When Day’s Constance realizes that the wedding ring Professor Night shows her is meant for someone else, we feel a real pang of sadness even if Constance tries not to let it show. It’s a wonderfully warm-hearted, richly comic performance that has us rooting for her all the way. The play takes place in three locations--Professor Night’s office at Queens, Desdemona’s Cyprus and Juliet’s Verona with a brief excursion to Hamlet’s graveyard--the Shakespearean locations, of course, situated somewhere in Constance’s mind. In the first scene Michael Peng is a fine Chorus; Elana Post, all too believable as a student making transparently false excuses for a late paper; and Jane Spence, suitably imperious as Ramona, a Rhodes Scholarship winner who has also won over Professor Night. Stephen Russell is an excellent as the Professor, who is worse than outright slimy since he takes Constance’s slaving for him so completely for granted he barely notices her. Once we move to Cyprus the performance levels unaccountably drop down a notch. As Othello (thankfully without blackface), Russell seems to give a very serious performance while Peng as Iago is so unassertive it’s hard to imagine his character is supposed to be a villain. Since, according to Constance’s theory, both “Othello” and “Romeo and Juliet” are not tragedies but failed comedies, the Shakespearean scenes work best if their unintentionally comic aspects are played up. As Desdemona, Spence certainly conjures up Constance’s image of her as a warrior-queen, but Spence begins on a single strident note and stays there for too long. Once the scene shifts to Verona the performances return to striking just the right note. Post is excellent as a Juliet, a teenager as much fixated on death as she is on forbidden love. Peng captures Romeo’s melancholy but could give the character more personality. Spence is believable as a wise-cracking Mercutio. And Russell is in fine form as the lively Tybalt and is hilarious as Juliet’s bearded Nurse. The action takes place on and in front of a lovely set designed by director Douglas Beattie. It looks like a full-sized, roofed, four-columned toy Elizabethan stage in deep hues of green, red and blue with richly patterned curtains. All is enhanced by Jeff Johnston-Collins’s wide range of lighting effects, especially inventive in the comically woozy transitions from place to place in Constance’s mind. Brad Rudy has choreographed the exciting sword-fights in which both men and women take part. As usual Beattie’s direction is thoughtful and crisp. MacDonald sometimes packs in almost too many allusions per line, but Beattie and his cast make sure they all register. Unlike other directors of this play, Beattie realizes that not all passages are satirical but express MacDonald’s thoughts about love, transformation and the interconnectedness of things. It’s a pleasure that Beattie encourages the actors to bring out their beauty . This is a fine production, particularly notable for its attractive staging and the marvellous central performance of Marion Day. If you’ve seen the play before, you’ll get even more out of it in Beattie’s production. If you’ve never seen it before, don’t miss it. Photo: Michael Peng, Marion Day and Elana Post. ©Douglas Beattie.